Patient who suffer from temporal arteritis may complain of signs and symptoms such claudication of the jaw, unilateral throbbing headache and impairment of the vision. 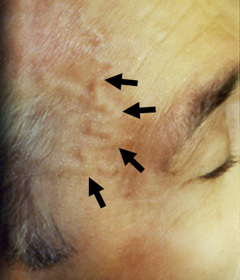 Temporal arteritis is commonly affecting middle age and elderly female. Pathologically,there will be a granulomatous inflammation of the tunica media. Giant cell as well as mononuclear infiltration are common.Temporal arteritis commonly affecting the small and medium sized arteries. There will be an occlusion of the ophthalmic artery and nodules along the temporal artery. Temporal arteritis may present with elevated ESR level. The causes of temporal arteritis is remain unknown. However, T cell mediated injury has been suspected. Temporal arteritis is treated with corticosteroid. 1.Heptinstall, R. H., K. A. Porter, and H. Barkley. “Giant-Cell (temporal) Arteritis.” The Journal of Pathology and Bacteriology 67, no. 2 (1954): 507–519. doi:10.1002/path.1700670224. 2.FAUCHALD, PER, OLE RYGVOLD, and B. ØYSTESE. “Temporal Arteritis and Polymyalgia RheumaticaClinical and Biopsy Findings.” Annals of Internal Medicine 77, no. 6 (December 1, 1972): 845–852. doi:10.7326/0003-4819-77-6-845.